During the initial shooting of Guru Sishyan in AVM studios, many people used to come and see Rajini. Once Rajini was sitting on a couch and was talking to some producers (they were standing). The list included even people who had produced Rajini movies. Radhika dropped in during one such moment and Rajini surprisingly got up and was seen talking to her standing. This is the respect which Radhika got. So what was the experience of Radhika on sharing screen space with Rajini on movies like Pokkiri Raja, Ranga, Nallavanukku Nallavan, and Ooor Kavalan? I once went to interview Rajini for a magazine and that was my first experience of interacting with him. He won’t speak much. During then, he told me “Wishes, you are acting with me in Pokkiri Raja”. I got this news directly from Him. We shot for a famous song “Pokkirikku Pokkiri Raja”, somewhere near Thirupati and for a scene I had to jump on Rajini’s shoulder. The shot was kind of a mess and we had to retake for nearly 12 times. Rajini did not smirk even once. Also in the movie I had to jab his face many times (nearly throughout the movie). It was of-course acting, but then many times I really jabbed at his face. But he dint react even once. I couldn’t understand the kind of person he was. We acted in a Hindi movie called “Asli Nagli” (Dubbed as Naane Vallavan in Tamil). I had to again jab his face for a scene. Rajini came to me sarcastically scratching face and told me “Guess you haven’t completed the job you started in Pokkiri Raja”. Chatrukuna Singha was another hero in the same movie. If the shooting is scheduled for 9:00 AM in morning, he would leisurely walk into the set by 3:00 – 4:00 PM in the evening. But Rajini and I would compete with each other to make it to the set well before scheduled start. Sometimes no one would be there to serve even a coffee and we would have to spend time seeing each other in a sorry state. Rajini also started simultaneously shooting for movie, “Anda Kanoon” in Hindi while he acted in “Pokkiri Raja”. We shot a song in Chennai Anna Salai and after a quick shot we used to hide inside our cars as fans would throng Rajini. During this time he used to tell me dialogues from that Hindi movie.. I never really understood if he was telling me the movie dialogues or if he was actually talking to me in Hindi. During the shoot of Nallavanukku Nallavan, Rajini and I use to compete a lot. 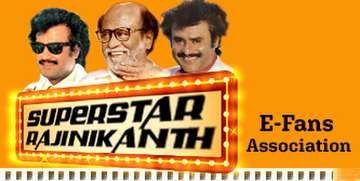 One has to be very careful with Rajini on this. His performance before the camera would not be same as to what he does while practice. He will add some extra stuff when the actual scene is shot. We should expect this and perform with him. If I have a solo shot Rajini would not rest as he is free. He would observe my acting and sometimes he would even shower praises on me..
During free time Rajini use to speak a lot on Spiritual philosophy. I would tell whatever I know and would try to corner him. He becomes silent sometimes during such discussions and I could feel that he is constantly thinking. So I used to make fun calling him a thoughtful genius. We also had a long shot for the song “Unnaithane” in this movie. We had to walk a long distance for this shot and during then Rajini told me “What’s there is this life? I am seriously thinking about going as a saint”. For that I told him, you are a big Super Star. You position would not change. I think you would not become a saint and I was confident. This is what we spoke during the shooting of that song. Comedy acting is not a very easy task. Action as well as reaction is very important for the people to actually relish a joke. Rajini is too good at this. His timing is awesome. There was a lot of comedy in the movie “Ooor Kavalan” and people appreciated me for my role. Everyone likes Rajini in the industry. This is because he sees a lot of other movies and always showers praises if he likes the performance of someone. He is really generous in praising others. I have low blood pressure and I also won’t eat much during shooting times. So sometimes I feel dizzy. Rajini used to advice me a lot regarding eating the right kind of food. Sometimes to instigate me he would say that shooting would get cancelled if I go unconscious due to lack of proper food. I like Rajini’s style in particular. There is a lot of power in his eyes. Its magnetic, it can draw people in his sphere of influence. Rajini’s wife Latha is also a very good person like Rajini himself. We are good friends and we meet pretty often to discuss a lot of things.